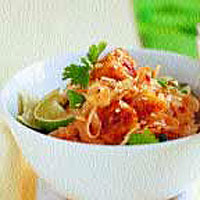 Pad Thai is traditionally made with eggs and prawns, but our recipe uses tofu (soya bean curd) instead. Cook the rice noodles according to the pack instructions, then cool under cold running water to stop them cooking further and drain thoroughly. Cut the tofu into 2.5cm chunks and dust evenly with cornflour. Heat the oil in a wok and fry the tofu on one side over a high heat, without stirring, until golden. Carefully turn over and fry again without stirring until evenly coloured on all sides. Add the mange tout and beansprouts and cook for 2-3 minutes until heated through, then add the noodles. Pour the sachet of noodle sauce into the pan and mix thoroughly until heated through. Sprinkle with peanuts, garnish with coriander and serve immediately with lime wedges.